Durian flowers open in mid afternoon (some as early as 2.30pm). Altough the flowers open, the anthersbdo not dehise and release pollen until about 7pm. Pollen grains function maximally at 9.30pm but falls off in the early morning, giving off an odour of sour milk. Pollen stored in refrigerator remains viable up to 2 days after anthesis. Stigmas are receptive to pollen 36 - 48 hours before the flowers are fully open. By early morning, the calyx, corolla and staminal groups have abscinded leaving only the pistil attached to the receptacle. Such happening can varies between clones by several hours. It is observed that hand pollination and surgical removal of the outer floral parts 36-48 hours before anthesis flowers open and leaving only the pistil, result in a greater percent fruit set than hand pollination of fully mature flowers. 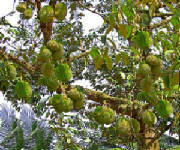 Durian trees have some mechanism to selectively abort some of its excess fruits. Therefore, artificial pollination above that limit is not useful. Trees with more flowers tends to have a lower percentage fruit set. Mature trees need up to 360 litre of water per day. Durian trees are found to be very sensitive to transplanting in the yield. Newly germinated seedlings are most successfully transplanted before the first set of leaves open. Seedlings are often transplanted into black perforated polyethelene bags at 3 -4 weeks. lateritic and granite derived soils are ssutiable. Trees grow better in less fertile upland soils than in more fertile marine or alluvial soils. Trees (not seeds) are best planted in deep (more than 75 cm), well drained, loamy soils with high content of organic matter. Durian fruits generally fall from the trees at night. Fruits are best harvested from 105 to 110 days after anthesis. Fruits harvested too early before 100 days will not ripe properly. Harvesting of immature D24 by hand shown increased shelf life from 3-4 days ( by fallen fruits) to 9-11 days. Durian fruits are best stored at optimum cold 3.9C degree to 5.6 C degree. If kept below freezing point (23C degree) fruits still taste good after 4 months but not up to standard fresh ones. According to the bibliographic review by Michael James Brown (1997), the origin of the word “durian” comes from the Malay word “DURI”. It means “spine” and the word “Zibethinus” refers to the Indian Civet cat “Viverra Zibetha”. (Therefore, we can assume that the origin of durian could likely be from Malaya, Indonesia, Siam or perhaps even India - whose vase dialects and resources are not easily available in English translation. For the lack of further evidence, the origin of Durian is currently attributed to that of the Malayan states. 4)*"Durio graveolens" , known as durian burung, durian kuning, durian merah, durian otak udang galah, tabelak or red-fleshed durian. It is a large tree up to 50m tall. The husk of its fruit is orange-yellow, covered with pyramidal 1cm long spines. The fruit has sweet crimson-coloured flesh and a fragrance of roasted almonds. 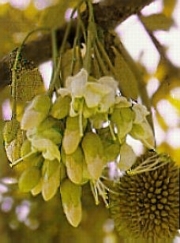 "D. graveolens" resembles "D. dulcis" but its fruit opens while it is still on the tree and has dark red flesh, whereas the fruit of "D. dulcis" drops unopened and has dark yellow flesh. Durian suluk, also known as durian siunggong, is a natural hybrid between "D. zibethinus" and "D. graveolens", and retains the flavour and texture of "D. zibethinus" with subtle burnt caramel overtones of "D. graveolens". Durian simpor is a mild-flavoured, yellow-fleshed variant of "D. graveolens". 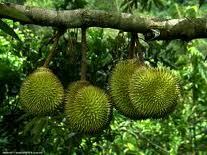 6)*"Durio lowianus" , known as durian duan. It is a large tree up to 50 metre tall, has red flowers and elongated. Its oval-shaped fruit contains yellow flesh. 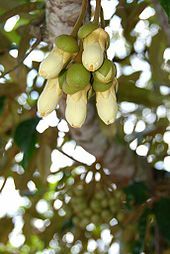 8)*"Durio oxleyanus" , known as durian sukang, durian beludu, isu or kerontangan. It is a fairly large tree up to 4m tall. It produces small, round, greyish-green with large, stiff, broadly pyramidal, slightly curved spines. The flesh is yellow, smooth-textured and sweet. 9)*"Durio testudinarum" , known as the tortoise or kura-kura durian. It is a medium-sized tree up to 25m tall. Being a self-pollinated species, it is less variable, and has an extended flowering season. The flesh of its fruit is pale yellow and has a stronger aroma than other species of "Durio". 10)* "Durio acutifolius" (Mast.) Kosterm. : distributed in Kalimantan and Sabah. 11)* "Durio affinis" (Becc. ): distributed in West Kalimantan and Sabah. 12)* "Durio beccarianus" (Kosterm. & Soegeng. ): distributed in West Kalimantan. 15)* "Durio carinatus" (Mast. ): distributed in Peninsular Malaysia, Borneo. 16)* "Durio crassipes" (Kosterm. ): distributed in Tenom and Sipitang areas of Sabah. 17)* "Durio excelsus" (Korth.) Bakh. : distributed in Kalimantan. 18)* "Durio griffithii" (Mast.) Bakh. : distributed in Peninsular Malaysia, Sumatra, Borneo. 19)* "Durio kinabaluensis" (Kosterm & Soegeng): distributed in Sabah. 20)* "Durio lanceolatus" (Mast. ): distributed in Borneo. 21)* "Durio lissocarpus" (Mast. ): distributed in Borneo. 22)* "Durio macrolepis" (Kosterm. ): distributed in Peninsular Malaysia. 23)* "Durio macrophyllus" (Ridl. ): distributed in Peninsular Malaysia. 25)* "Durio mansoni" (Gamble) Bakh. : distributed in Myanmar. 26)* "Durio oblongus" (Mast. ): distributed in Sarawak. 27)* "Durio pinangianus" (Ridl. ): distributed in Peninsular Malaysia (Perak, Penang). 28)* "Durio purpureus" (Kosterm. & Soegeng. ): distributed in West Kalimantan. 29)* "Durio singaporensis" (Ridl. ): distributed in Peninsular Malaysia. 30)* "Durio wyatt-Smithii" (Kosterm. ): distributed in Peninsular Malaysia (Trengganu).